One perfect example: Overanalyzing the hell out of Disney Channel programming. 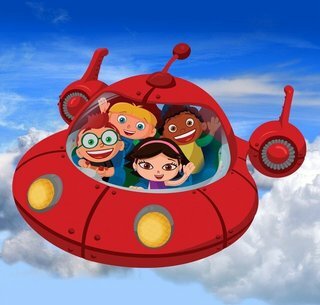 “Brainpanhandler” at the Rigorous Intuition Forum is freaked over the Disney cartoon Little Einsteins because he thinks the villainous jet that tries to thwart the kidlets leaves a chemtrail behind it. 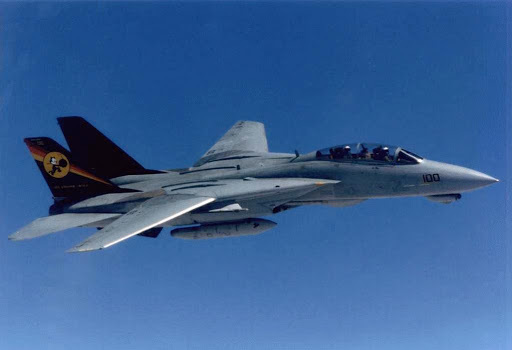 Also, the jet vaguely resembles the F-14 Tomcat. And another Disney Channel cartoon, Down Perry Scope, is spy-themed. And one game on a Disney website resembles another game on the CIA for Kids site. Brainpanhandler’s conclusion: “Disney is CIA for kids”.Crikey. I guess we should fry that New World Order shill, Harriet the Spy? There are plenty of good reasons to dislike Disney, but this probably isn’t one of ’em. Save the paranoia for something important. And for the love of God, stop watching the Disney Channel! This entry was posted in Chemtrails, Conspiracy Theories and tagged conspiracy theory, New World Order, TV. Bookmark the permalink. “Brainpanhandler” needs new glasses if he thinks that looks ANYTHING like a Tomcat!I’ve heard that cartoon chemtrails are a lot more toxic than real ones. ;)SoG, was that the Robot Chicken episode where Walt’s head was kept alive in the Disney “vault”? Hilarious! Wait, sadly enough I don’t think I even have to google “robot chicken walt disney”…you mean of course that he is a cyborg who consumes Cuban children, am I right? Mom, it’s true: Cartoon chemtrails will MESS YOU UP. But the real ones are pretty harmless. Go figure.I had to sit through a chemtrail discussion yesterday. A guy I shall call Mitch (because that’s his name) suspects that the barrium salts and aluminum oxide in chemtrails are a medium for the vibrational frequencies of HAARP, which of course make us stupider and more suggestible.Must be working. P.S. The Disney-in-the-Vault cartoon was on TV Funhouse, from SNL. Oh, don’t be so sure about that…Somewhere, at this minute, a nervous twitchy guy in a cafe is warning his friends in a whisper that Walt Disney has been resurrected as a child-eating cyborg. Link to original RI threadLink to split off thread regarding potential normalization psyops of weather engineeringYou might want to read my posts a bit more carefully. No offense, Mr. Handler, but not really. I hear about the latest trends and theories in chemtrail-atology from a few friends. Some of these theories are more likely than “Walt Disney is a child-eating cyborg”, but only slightly. Idiot. You completely misrepresent what I wrote. It’s as simple as that. Read it more carefully. “Walt Disney is a child-eating cyborg”, Strawman. Go ahead and argue with yourself. Twit. Handler, YOU are the one who Googled yourself to arrive here, so who is really the TWIT? Mmm, yes. Mr. Handler sees CIA psyops in a cartoon, but I’m an idiot. He’s probably right. About everything. I’m fortunate to have folks like him setting me straight. How would I ever know anything, otherwise?It’s so hard, being one of the sheeple.But on a non-sarcastic note, there IS a “misrepresentation” here: The jet-thingy that the Little Einsteins are in isn’t the Tomcat-like jet; that’s a different jet in the background, which has a contrail that’s partly hidden behind a cloud (hence, a “chemtrail”). This jet is apparently the villain. However, none of this has any real relevance to the gist of Mr. Handler’s post, which is to suggest that children’s programming is seeded with subtle imagery designed to habituate children to the idea of funny clouds/contrails in the sky (“chemtrails”). Readers can follow the link I provided and make up their own minds about the information. That’s what skepticism is about. As everybody else probably knows, “Walt Disney is a child-eating cyborg” is not a straw man argument. It’s *humour*. I need lots of it to survive this level of wackiness without going insane.And on a completely unrelated note: Please, people, stop Googling yourselves! It’s sad, sad, sad, sad, sad.Sad. “And on a completely unrelated note: Please, people, stop Googling yourselves! It’s sad, sad, sad, sad, sad.Sad.”Actually, it’s a fairly sensible practice and it is indeed what led me here. You might well argue that the result is sad, sad, sad. And you’re not nearly done correcting your misrepresentations and you know it. I’ll retract the “idiot” and “twit” commentary so as to place the full resposibility for your willful distortions where it belongs. To readers of this blog: follow the links I provided. Carefully read what I wrote and then compare it to SME’s characterization of what I wrote.Why read commentary from someone who willfully twists someone else’s words in order to be more entertaining? That is sad, sad, sad. I have not willfully distorted your message in any way, Mr. Handler. Anything expressed here is my own interpretation and opinion of information, and I encourage readers to consult the original sources of that information whenever possible. Your opinion that cartoons are possibly being used to normalize chemtrail-spraying is not any more tenable than my opinion that they are not; we’ve seen the same material and reached different conclusions about it. I suspect a few Disney animators and writers might feel that you’re willfully distorting their work. Now if you don’t mind, I feel I’ve spent enough of my time on this particular subject for now.Be seeing you. or guest authoring on other blogs? I have a blog based upon on the same ideas you discuss and would really like to have you share some stories/information. I know my visitors would value your work. If you’re even remotely interested, feel free to shoot me an e-mail.